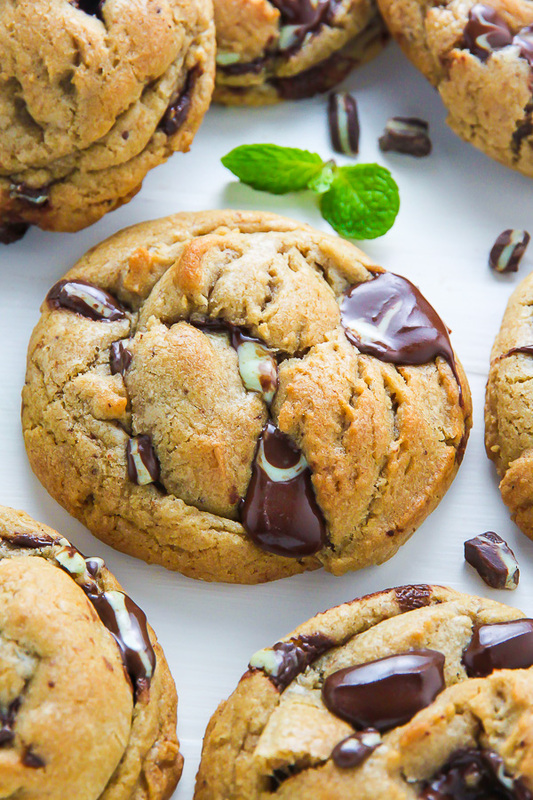 If you adore the combination of mint and chocolate, these thick and chewy mint chocolate chunk cookies are for you! 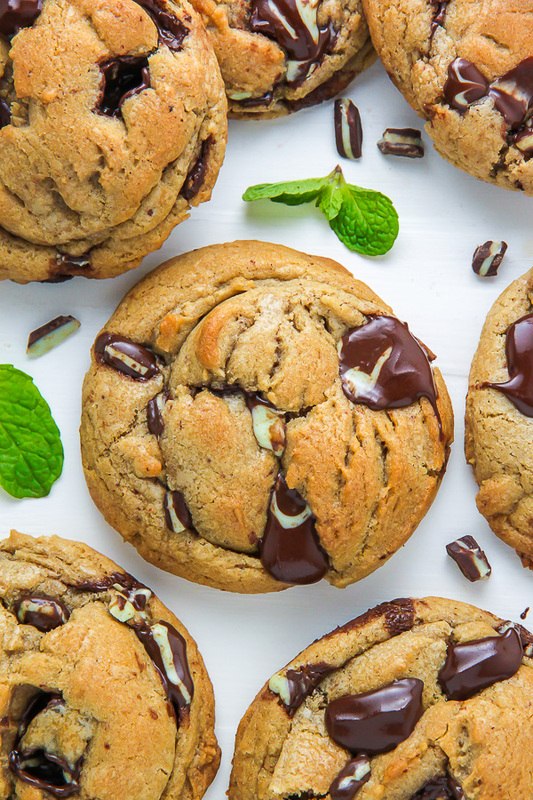 a must try for mint chocolate lovers! Fact: If I could only bake one dessert for the rest of my life (an idea I don’t like to imagine), it would probably be cookies. Because really… is there anything more comforting than a fresh baked batch of cookies? I don’t think so. 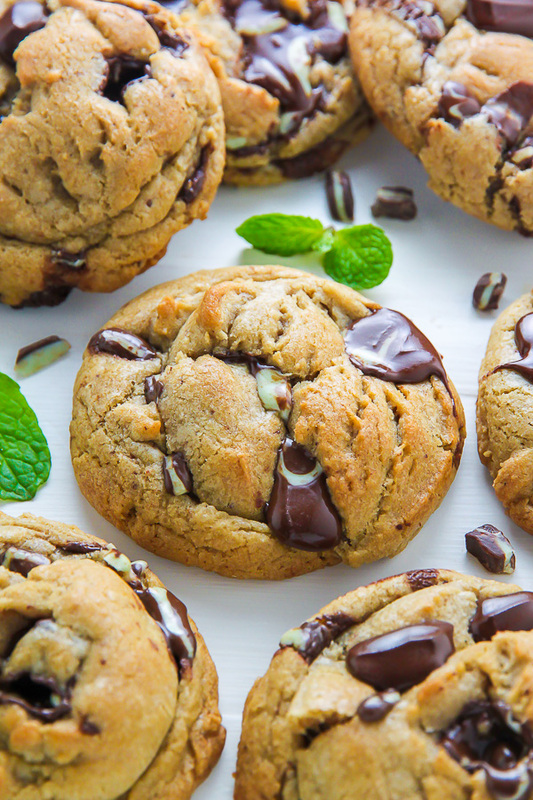 Today’s cookie recipe is inspired by one of my favorite ice cream flavors: mint chocolate chip. I’m already dreaming of sunny Summer days… cut-offs and ice cream cones! But I digress. 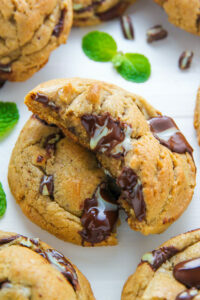 I already have a ton of chocolate cookie recipes on my website, but somehow, none including mint! This issue had to be remedied at once. After a few frustrating fails, I finally nailed the perfect mint chocolate chunk cookie! 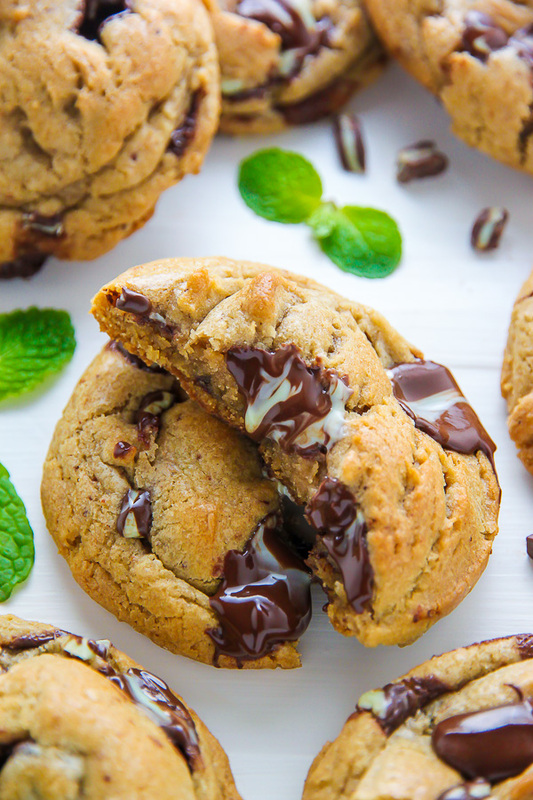 The mint flavor is pure and profound without being overbearing, and the generous amount of semi-sweet chocolate chunks helps balance everything out. Due to peppermint extracts very powerful nature, I do not recommend using more than called for in the recipe. A small amount goes a long way. 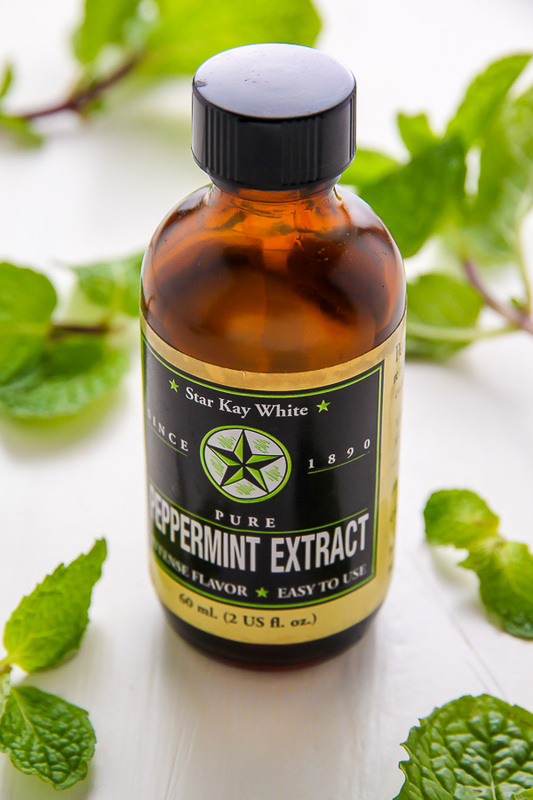 If you cannot find peppermint extract and do not want to order it online, you may leave it out, or replace it with vanilla extract, however doing this will cause the cookies will lose a lot of their unique peppermint flavor. You won’t need an electric hand mixer or stand mixer to make these cookies. You will need to chill the dough for 2 hours. Once the cookie dough has sufficiently chilled, you’re ready to roll and bake. BE SURE YOU DON’T OVER BAKE THESE COOKIES. Sorry for yelling, but you’ll thank me later. These cookies only need to bake 9-10 minutes (depending on your oven), or until they’re golden and set at the edges. Don’t fret if they’re still a little soft looking in the center, they will firm up a lot while they cool. You’re going to let the cookies cool for a full 10 minutes on the cookie sheet, before transferring them to a cooling wrack. Do not attempt to move the cookies off the tray before the 10 minutes are up, or they may crack or fall apart. Thick and chewy mint chocolate chunk cookies! The ultimate flavor combination. Place the butter in a small sauce pan over medium heat and cook for about 2 minutes - stirring frequently - or until the butter has completely melted. Remove from heat. Transfer the butter into a large mixing bowl. Add both sugars and the peppermint extract and, using a metal whisk, beat smooth. Beat in the eggs, one at a time, mixing well after each addition. Set aside. In a medium-sized bowl combine the flour, baking soda, salt, chocolate chunks, and Creme De Menth baking chips; whisk well to combine. Add the dry ingredients into the wet ingredients, stirring just until combined. Cover the bowl and refrigerate for 2 hours. Preheat oven to 375 degrees (F). Line two large baking sheets with parchment paper. Roll 3 tablespoon-sized scoops of dough between your palms to form a ball (they should be big; almost a 1/4 cup), then place on prepared baking sheet (make sure to leave enough room in between each cookie for inevitable spreading). Continue this process until all the dough has been rolled. Place baking sheets in preheated oven - one at a time - and bake for 8-10 minutes, or until golden at the edges but still soft in the middle. Let cookies cool for 10 minutes on the sheet before transferring to a wire wrack to cool completely. These cookies are best on the day they are baked, but will keep, in an airtight bag or container, for up to 4 days. *Cookie dough may be made up to 48 hours in advance, but the dough will need to sit at room temperature for 20 minutes, or until it is still firm but scoopable. *Do not over bake these cookies. They are done when they are set at the edges, golden, and still a little soft in the center. *If you'd like your cookies to look like mine do in the photos, gently press a few extra chocolate chunks and Creme De Menth pieces on top of the warm baked cookies right when they come out of the oven. These cookies look amazing!! 3 TB is a really big cookie (to me), though! Would making the cookies a little smaller (like 1 TB) alter the recipe very much? Maybe a lower cook time? Can’t wait to try these! Hi Laura! You can make them smaller, but I wouldn’t recommend going under 1 and 1/2 tablespoons. Also you’ll need to reduce the bake time by a few minutes. Just keep an eye on them as they bake – once the edges are set and the centers are almost set, they’re done! These look incredible. That gooey chocolate-mint chip shot…WOWZA! Can I use pure peppermint essential oil instead of extract? If can, How much? Thanks!! Can’t wait to make them! Hi Eileen. I’m not sure what the difference between an extract and an oil would be, so I can’t really advise. I would recommend doing a quick google search on the substitution to be sure it’ll work. Can the measurements of all the ingredients be given in grams please ?